Every day, perhaps tens of thousands of new URLs are grouped by Google News into different news clusters, with the links in one cluster indicating that they're reporting the same story [determined algorithmically]. That's how Google News works. Google News machines do a lot of hard work to determine which stories should be grouped together into a cluster, but Google Search is not properly utilizing this hard work. 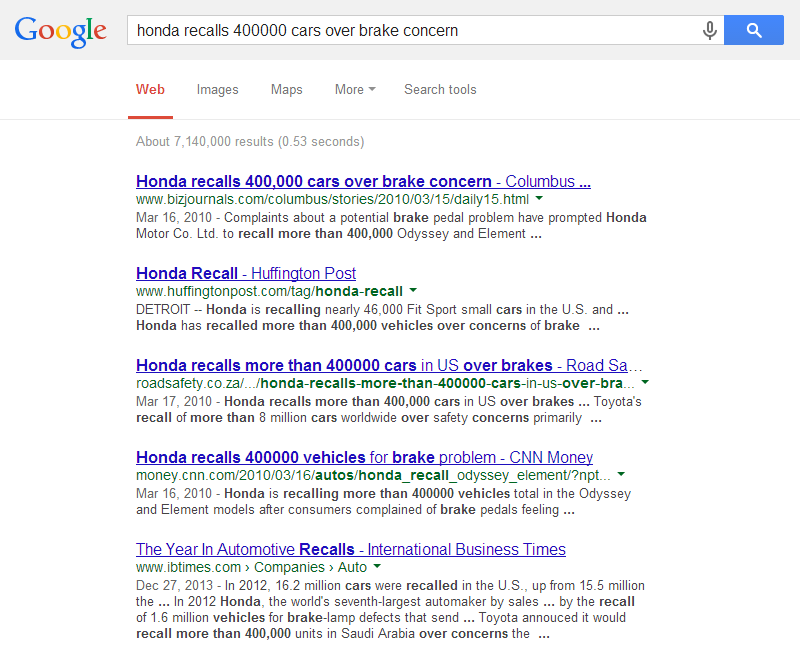 For example, this is an actual screenshot of one news cluster from Mar'10, about a massive recall of cars by Honda. The top link in this cluster is from Bizjournals.com. Suppose at that time you had saved this story from Bizjournals.com, and opened that saved PDF file only today, in 2014. And suppose that today you are interested in looking at the perspective - on the same event - of other news outlets. Clearly, if you had access to the original news cluster that Google News had produced and shown back then, it would solve your purpose. However, if you copied the title of the saved Bizjournals.com story that you have on your hard disk into Google Search and look at the results, you'll notice that you cannot recall the original news cluster of which this story was a part of. In fact, you cannot even know or be sure that this story was even a part of some news cluster back then. Google Search does not give you any way to know, or to reproduce the original cluster. I think Google Search should indicate - perhaps by way of a small icon beside the result - that one or more of the search results on the page can be expanded into a Google News Cluster, thus adding much depth for those who are interested in exploring that particular result. Pretty confident that this feature will be useful to users.